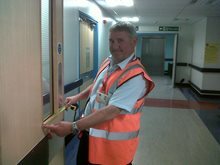 "The FDIS or Fire Door Inspection Scheme is a service that has been created by both BWF – CertiFire and the guild of architectural ironmongers. Both of these are the leaders in fire doors and their parts." FDIS inspectors offer a professional and thorough service for people who require a detailed survey of the functionality and condition of their building’s fire doors. These inspectors have gone through rigorous training and assessments so that they are now completely qualified and certified to show that they are more than competent of doing the job this means that managers and building owners are confident with the inspectors work. When an FDIS inspector comes to survey your doors you can be happy that your building will be safe or if it isn’t you will be told how to resolve and improve the situation. As well as this it can make occupants at the building see that you are choosing a good company to help keep them safe and that you take fire safety very seriously. FDIS have people inspecting a range of things such as; office buildings, schools, student accommodation and more. Every one of FDIS’s customers can feel safe, and that their doors will behave in the way that it was intended, if a fire ever does break out due to their inspectors who have the highest attention to detail, skills and knowledge. The fire doors are inspected by very well qualified and skilled people who have been meticulously assessed by Exova Warrington Fire, who are an independent third party. Once an inspection has been made a detailed written report will be created about the fire doors, their functionality and their condition, this report is kept secure both as a physical copy and online. This report can be used for the person responsible for fire safety in a building so that when there is a fire risk assessment they know the requirements of the doors and if they are still up to a good standard. All the requirements and the regulations needed for the doors will be held in the report. Once a fire door has been inspected a label is attached to the door which has necessary information on it such as the date in which the door was last inspected. This shows to people who use the doors have been inspected expertly. It is vital that fire doors are working correctly. To ensure that a building is as safe as possible from a fire, a fire risk assessment needs to be done once a year. A risk assessment includes checking whether fire doors will work to maximum efficiency and with maximum protection. FDIS are one of the best agencies for fire risk assessments as well as checking that fire doors will be functioning to the best of their ability.